The South African automotive industry will gain insight to the strategic direction of the soon to be finalised Automotive Masterplan at the NAACAM Show being held at Durban’s ICC on April 5-6. The Masterplan's objective is to develop a clear vision for, and a support programme and policies for the optimal development of the South African automotive industry through to 2035. Policy structures within the Masterplan will replace the current government support programme, the Automotive Production and Development Programme (APDP), designed to run out in 2020. Toyota SA President and CEO, Andrew Kirby will share his views on the plan together with NUMSA General Secretary: Irvin Jim and SP Metal Forgings MD: Ken Manners, both of whom are part of the oversight committee, at a dedicated session of the NAACAM Show on Wednesday April 5. The key presenter and facilitator in this session is Automotive Masterplan Lead, Dr Justin Barnes. Over 400 executives will attend the two-day Conference, which features 13 sessions on issues with which the automotive industry is grappling, including Trade in Africa, The Future of the Auto, Manufacturing Best Practice, Tooling, Skills, Black Supplier Development, Tooling and Logistics and Supply Chain Management. 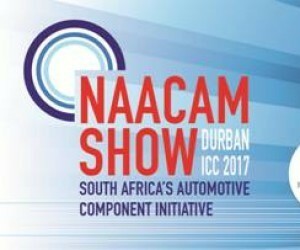 NAACAM President, Dave Coffey said the conference, which runs alongside the exhibition featuring over 200 companies, and the Durban Automotive Cluster's National Localisation Indaba, would move the industry forward. "Ahead of the completion of the Automotive Masterplan, the Show will assist the wider industry and state partners, understand and appraise issues common to both the country's economic imperatives and private business growth. Two themes running strong through the Show are localisation and black economic empowerment. It is of no co-incidence that these two factors are key to achieving the objectives we’ve agreed to under the Masterplan. It is my belief that the NAACAM Show provides an unprecedented platform for industry and government to connect in a very practical way around these foundational issues." Coffey said in addition to identifying a need to keep attracting higher levels of investment, the post-2020 plan seeks to maintain the export strength of SA but simultaneously capture greater domestic vehicle and component market share, while also targeting the development of black-owned component suppliers – all of which should create more jobs and economic spin-offs in the South African automotive manufacturing sector. Two national ministers, Dr Rob Davies and Mr Ebrahim Patel will address industry at the Conference together with five international guest speakers, three South African OEM CEOs and 30 other political and industry leaders.